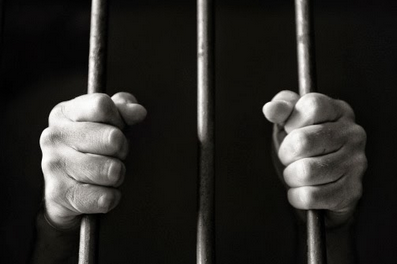 I read a fascinating article by Christian Jarrett at The British Psychological Society blog: “Jailed criminals think they are kinder, more trustworthy, & honest than the average member of the public”. I had previously seen research showing how research participants believed that they were better drivers than the average, that they were more capable managers than the average, and that they were more intelligent than the average individual and so on. (Note: All of these are impossibilities since all the people in any given population cannot be better than the average and hence people are biased in how they think about themselves). But criminals believing they were better than the average member of society was a surprising finding. This is a classic cognitive bias that affects people’s self perceptions and their consequent behavior. I started thinking about the sanitation behavior change project that Arghyam is doing in Davangere, and how it might be getting affected by the subconscious biases that people in the target villages hold. Readers can read my last post which describes this project here. The “awareness through IEC” part of the program uses the “Responsible Man” as the core communication lever. It tries to get men to realize the problems (mostly around personal safety and dignity) that women and girls in their families face in the absence of a toilet. The “Better Man” bias: Men in these villages might believe that they already are a much better husband, father and son than the average man in their village or the Gram Panchayat, and thus might not respond strongly to the “Responsible Man” message. This might lead to reduced participation in the program with fewer people filling in the application forms than ideal. They might then also fall prey to “mental accounting” processes and conclude that they don’t need to invest in a toilet. The “Invincibility” bias: Men might believe that their wives, daughters and mothers are less likely to get harmed in the absence of a toilet than the actual likelihood of this happening in reality. This belief will reduce their propensity to act and get a toilet constructed. This “reduced threat perception” is exacerbated in this case because of such issues being taboos and many incidents going unreported. The same bias applies to situations when people feel they are extremely unlikely to fall sick (due to not having a toilet). If some probing reveals the existence of these biases in the target population, one can design program features to tackle them in future campaigns that are replicated in other locations. While the specific features would be very context specific, a design principle that could be useful is that of comparison. For instance, the Better Man bias can be tackled by creating video clips that show men from the village talking about how they don’t think they’ve discharged their “responsibilities” till all the women in the house have a toilet. Essentially, ensuring that there is a yardstick on which cultural notions of “male responsibility” can be made visible and based on which people can situate themselves objectively and realize if and when they are not making the cut. Imagine your house didn’t have a toilet. Now, imagine all the houses near yours didn’t have one either. You were all forced, day after day, to run out when nature called, find a bush that fit your dimensions and do your business. All the while taking care to not sit on your neighbour’s pile. Now imagine your government decides to build you all free toilets. This is the first time you are coming upon this wonderful structure. This magnificent invention that gives you the freedom to empty your bowels whenever you want. Heck, you could even throw in a cigarette and a newspaper while you are in there. What! Who doesn’t have toilets? Why is the government involved? Why aren’t the people constructing toilets themselves? The government has been building toilets since 1986 – it has spent several crores and built several lakh toilets. Yet, close to 3 decades after it began only 30% people have toilets. Puzzling isn’t it? Population growth, graft and poor construction have all contributed to this poor reach. The largest contributor is the absolute unwillingness of people to go in, and shut the door behind themselves. They do not understand why toilets are magnificent. So, they do not demand accountability or ask for the latest fittings. Read the entire article (originally published on Amrtha’s personal blog) here. 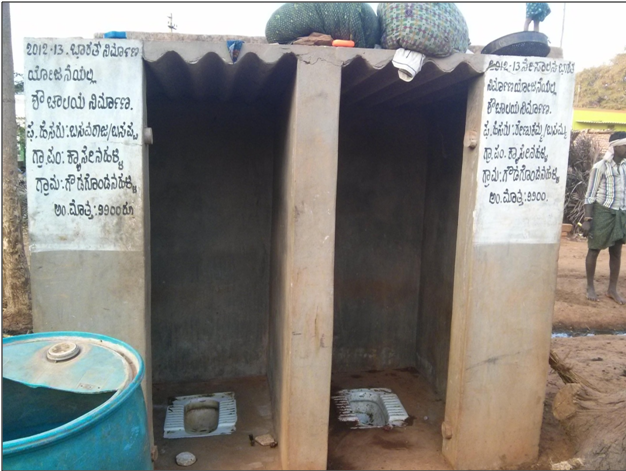 An important part of the behavioural change communication in Davangere is Final Mile’s work on toilet usage and behaviour (more here and here). 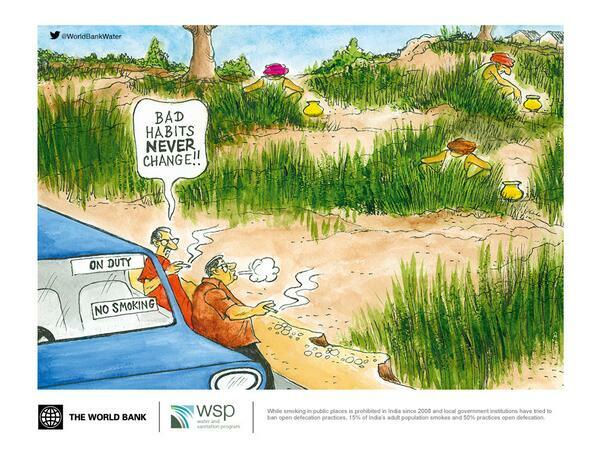 Here the intervention focuses on households who already have toilets, but have a discernible usage problem. The intervention is designed around a series of subtle behavioural nudges that will help people understand and use their toilets better. In order to understand the impact and effectiveness of the intervention, Arghyam is partnering with an external agency, Catalyst Management Services (CMS), who will measure and evaluate the outcomes of the project. They will conduct a baseline survey before the intervention and an endline survey shortly after. The surveys have been designed keeping two respondents from each household in mind – one male and one female. Only households with toilets are targeted. The survey has been designed quite elegantly; it’s a neat, tight set of questions focussing on usage. We’re trying to gauge toilet behaviours of every member in the household and trying to see if there are patterns – so, who all use the toilet regularly? For what purpose? Is toilet usage seasonal? Do people know how to use and maintain the toilet? What do people do when they’re not at home – where do they go? Why did they build a toilet? Where does the toilet rank in terms of financial prioritisation within the household? Apart from these questions, the investigators also examine the toilet. This gives us an indication as to whether the toilet is actually being used (irrespective of the answers people may give) and this will also hopefully get a more truthful answer from the respondents. Along with some colleagues from CMS, we recently went to visit some of the villages in Davangere district where the baseline surveys were being conducted. As we cross Chitradurga and drive towards Davangere, the landscape quickly changes – the hills around Chitradurga give way to the flat plains of Davangere. Dusty roads cut straight through the Earth and everything has a brownish tinge, even the trees are covered with a film of dust. But as we cover the fifteen odd kilometres between Davangere and Harihar, the landscape undergoes another transformation. The dry flat plains give way to verdant green paddy and areca. This greenery is due to the Bhadra canal, which has brought irrigation to this side of the district. Farmers who used to grow ragi and other produce now grow paddy. It’s the kharif season, and the fields are full of fresh shoots, and it’s a lively bright green as far as the eye can see. We visited Budhihal, a village in Harihar taluka to check in on the household surveys. It’s a fairly affluent village, with a large number of pucca houses. The field investigators (FIs) are a bright bunch hired from in and around Davangere. They start their day by splitting up the list of households they have to visit. 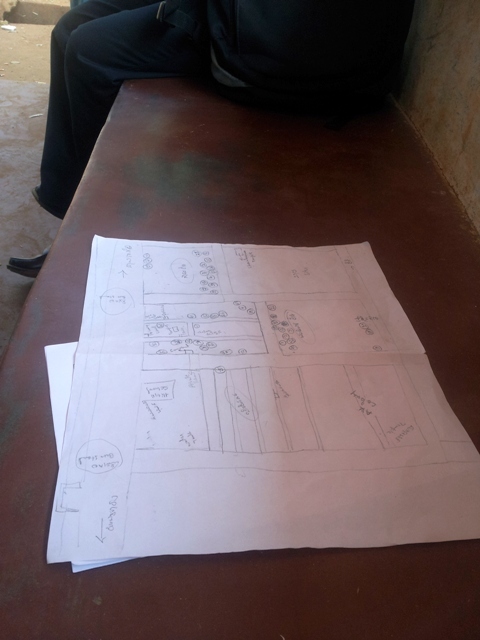 A social map of the village – drawn up with the help of some villagers, helps map the village, the key common public spaces, identify the different communities and where they live, and the geographical spread of households having toilets. They split up the clusters of households amongst themselves. Armed with stacks of surveys they set off into the village. It’s a difficult task. Most surveys ask fairly objective questions but since this survey looks at usage, questions can be unexpected or sensitive. I tagged along with the women investigators, who were interviewing women only. The trick here is to put the interviewee at ease, and to conduct more of a discussion or conversation rather than a formal interview. I was impressed with the way in which the FIs, young girls, were able to strike a rapport almost immediately with the respondents. At times when people didn’t understand the question, they were good at explaining the question to the respondent without leading them towards the answer. It’s a difficult yet important job really, going from house to house in the hot sun, asking the same questions over and over again, but they did it cheerfully and enthusiastically. Baseline and endline surveys will provide data on ‘before’ and ‘after’ the intervention – they are snapshots in time. What they don’t capture are changes in human behaviour that may not adhere to our time bound interventions. So it’s also important to capture the narratives, thought processes and other experiences that the intervention may trigger off. 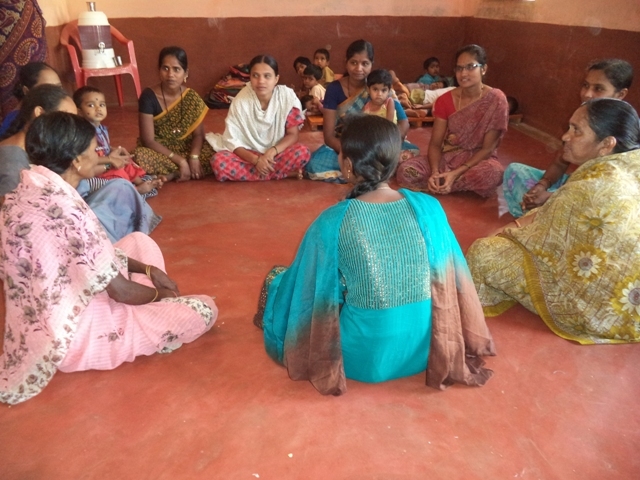 A series of focus group discussions (FGDs) with closed groups of men, women, and adolescents have also been organised to try and understand the dynamics around sanitation and toilet usage in the village. 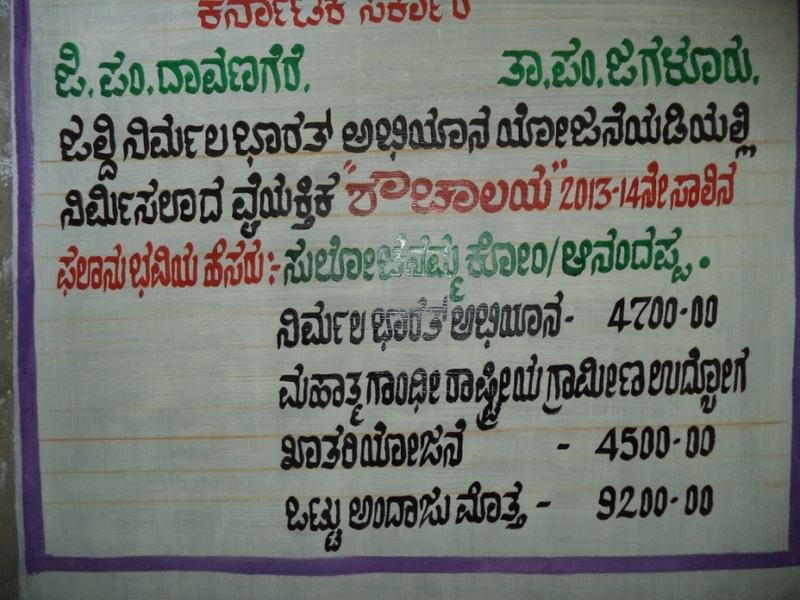 The day we visited Davangere, we dropped into a womens’ FGD that was organised in the local Anganwadi. The idea is not to only talk about one’s own experience, but to discuss the various narratives within the village. An FGD led by a good facilitator can bring out various themes from participants without stigmatising or enforcing a majoritarian view on them. Many interesting stories emerged from the FGD. Only some communities in the village have toilets. Women spoke about how these toilets have affected their daily routine, how it’s a burden if there isn’t enough water. Men, it turns out, seem to prefer to go to the fields when the irrigation canals are full – around 8 months of the year – rather than go at home. At the same time with irrigation fuelling agriculture in and around the village, there are fewer places women can go to defecate in the open. Narratives like this bring out the variety of experiences and thought processes going on. 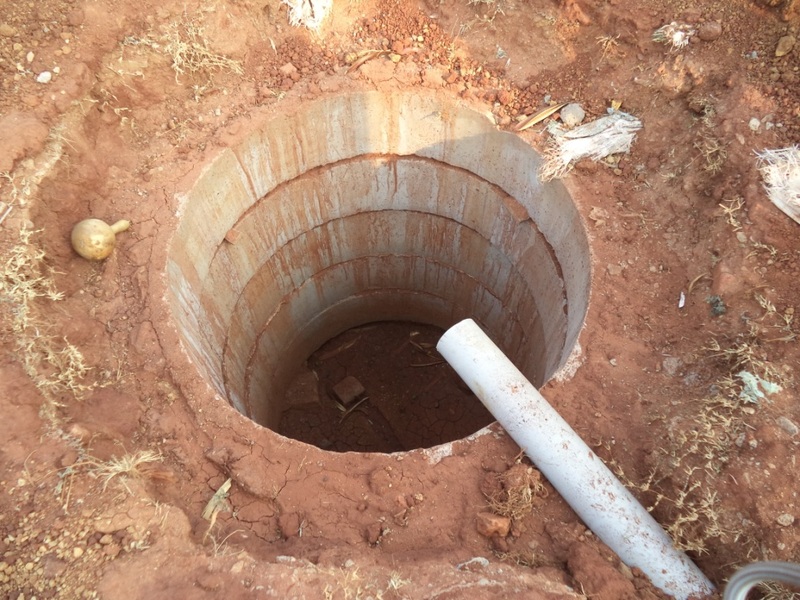 We begin to understand the complexity of the problem, the interconnectivity of water supply, groundwater, sanitation, irrigation, education, development (etc) through qualitative exercises such as this one. It’s easy to measure an intervention by defined outcomes that are captured through quantitative surveys. But equally important – and even more so since we’re talking about behavioural changes – are the processes and experiences that are influenced by the intervention. 50 toilets down, 19,950 to go! On Wednesday, 12th February 2014, I visited Maggidaragihalli village and Halekallu village, both in Halekallu Gram Panchayat, Jagalur taluk in Davangere where Centre of Gravity had done the pre-pilot in December 2013. I personally saw about 25 new toilets completed or close to completion, and there are upwards of 50 under construction in those two villages. Personally, this was a real high to see in person. A few people who had finished toilet construction were grumbling about non-receipt of the incentive. As part of the campaign, the CEO of Davangere district has made a promise to the people that the Nirmal Bharat Abhiyan (NBA) incentive for toilet construction will be disbursed in 20 days. (As a matter of fact, in the pre-pilot that was done in Maggidaragihalli, the promise was for 45 days). In later presentation to the Principal Secretary, RDPR Karnataka, he insisted that the state as a whole, not just this BCC programme should deliver the incentive in 20 days, so that was changed later in the communication material). This however means that the subsidy will be released within 20/45 days after construction of the household toilet is completed, as per the NBA guidelines. I was unable to get a clear picture from the complainants in this village, but feel that they may have misunderstood the time promise as starting from the day of construction of the toilet. In any case, the payment remains a critical aspect in the delivery of the NBA programme as a whole, and is vital to sustaining any demand that is generated through communication efforts such as these. While Arghyam is not responsible for subsidy disbursal, we will have to remain involved to see how we can facilitate and smoothen the process. One way we are doing this is by working on an IT tool to track the process of toilet construction and disbursal of incentive. The tool tracks the progress of toilet construction through various milestones (interest expressed, application submitted, pit dug, NREGA amount received, superstructure completed, photos taken, NBA incentive disbursed). The Swacchtha Dhoot or data entry operator in the GP enters the data for each toilet in progress. This then gives officials at the taluk and district level a way to track progress in construction, find the bottlenecks and laggards and push the process forward. The Swacchatha Dhoot is the frontline worker for the NBA programme, and will bear the brunt of people’s irritation over the delay in receiving toilet subsidy from the government. S/he will need a lot of support in the next few months, even after the campaign pilot is over. This is to ensure that follow up continues after the pilot is over. The toilets that have been newly constructed are really dark inside once the door is closed. Seeing this makes me feel now that this is really a missed opportunity, in that Final Mile’s findings about usability could have been incorporated at the time of construction. 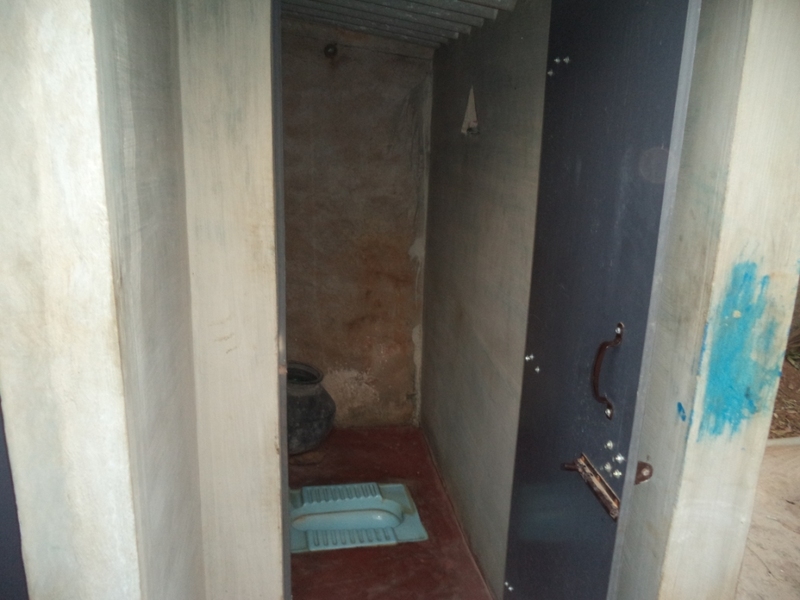 While the other factors like small size and lack of water are also issues, the darkness inside the toilet and lack of ventilation is very stark. We will try to start a process of engaging with masons right now to build in a way to get more light inside while the toilet is being constructed. We also need to understand from people who have constructed toilets in the past, on how they manage this factor. The relationship between lack of toilets, toilet usage and open defecation are the core aspects of the BCC project. We got the opportunity to visit two of the villages covered under the project, where it is being rolled out through village campaign and events. If enthusiasm and excitement are indicators of people willing to participate in a project, then we found it aplenty at Hikkimagere village in Kadabgere taluk of Davangere. Hikkimagere has 112 households (of which 12 already have a toilet). The village responded to the program well, with 88 tokens of interest being collected. The Panchayat Development Officer (PDO), Mr. Som Someshwar and others engaged with the people and were on hand to answer questions about the Nirmal Bharat Abhiyan. So was the panchayat president Mrs. T Vasathamma, who also highlighted the need to motivate and mobilise villagers at a personal level as well. At the heart of the BCC project lies the message of a responsible man addressing the sanitation and hygiene needs of women and girls by doing the right thing i.e. constructing toilets and using them. The men at Hikkimagere are doing just that and the women readily and happily talked about their plants to build toilets. 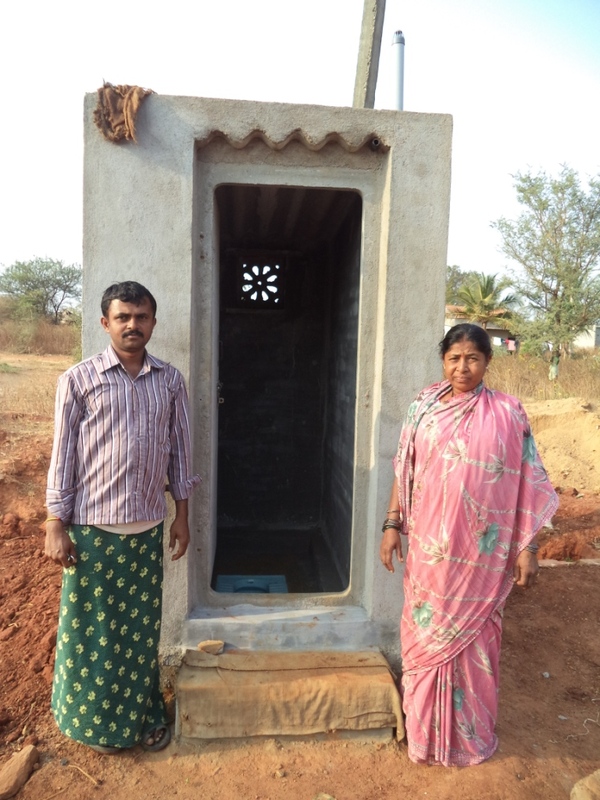 Kottaramma and Chandramma are two such women who proudly told us about their plans for building toilets. The most thought provoking account came from 70-year old H. Basamma, who lives alone and got a toilet constructed. She takes special care when bathing to cover the latrine with a stone, else the excess water would end up choking and clogging the latrine. She says the excess water from bathing can be used elsewhere, like watering trees and plants. 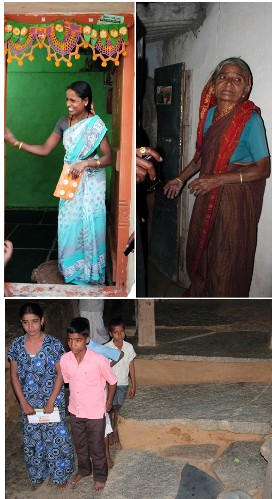 Left: Kotaramma, who signed up for a toilet after the event; right: H Bassamma showing her toilet; bottom: Chandramma has 7 members in her house. Toilet construction was planned to begin in 2 days in the empty space marked by flat rocks in the picture. 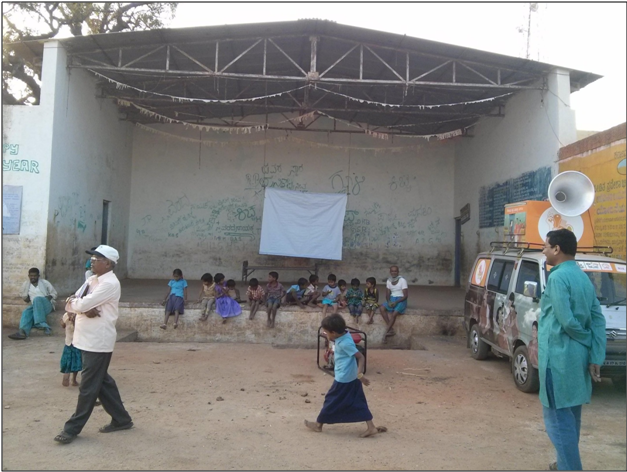 The village prepared itself for the evening show run by campaign manager Prabhakar and two artists, Manjula and Mahesh. The village representatives and the PDO assembled on the dais for the evening event, which started off with the PDO delivering a speech to the gathered crowd. The campaign team made public announcements, ran the campaign songs and then started the video program which contained the message from the CEO, the responsible man movie and testimonials of other village residents from different villages talkingthe importance of toilets in their daily lives. 45 females and 70 males from Hikkimagere village attended the evenings event. 11 pledges were collected in this process. The women were very interested in the ‘Sawal’ skit, which showed the perils of open defecation from a women’s point of view. About 300 children were in attendance too, of which 189 were from classes 8, 9 and 10. The second village, Rastemakunte in Bidarkere taluk had about 600 households. 400 people had gathered for the events and 54 tokens of interest were collected by the local swacchata doot, Mr. Rajappa. The village folk had a more lukewarm response when asked about the “Jaldi” campaign. This shows that a more intense effort is needed at Rastemakunte to invoke toilet awareness. This quote from the book Three Cups Of Tea by the now discredited writer Greg Mortensen rang true as I sat down to write about my experience on the recent field trip to Davengere with Vijay, Vasu and Krishnan. Over the last few weeks, I’ve been working with Arghyam to observe and document different aspects of this campaign to generate demands for toilets in rural Karnataka and recommend strategies for scalability and advocacy. Last week, over 2 days, I had gone to the field villages three times. And because the cups of tea were so small, ended up having six (or seven) rather than three 🙂 While I did not end up being part of the families of Davengere, I came back with a far more detailed understanding of what Arghyam and the district government and the various partners are trying to do through this project. Let me separate my post into five overlapping buckets looking at different aspects of this campaign the way I’ve been able to observe them so far. The overall context is that Davengere district needs to build 140,000 more toilets and have them used consistently to become open defecation free. The district population is about 220,000 households (or a million people) spread over 1,000 villages of differing sizes. According to the discussion with the District Support Unit for Sanitation Head, Mr. Basavarajjappa, they’ve managed to construct some 80,000 toilets over the last 20 odd years and want to construct the remaining 140,000 in the next two years! If I were an outsider, this would seem strange and perhaps a classic “supply side infrastructural push”. My fear would immediately be whether those toilets will be a) Linked to user demand b) Of high quality and c) Thus used. In this context, what Arghyam is doing – helping generate user-demand for the toilets that district wants constructed and then later follow it up with behavioral nudges – seems perfectly placed in these larger goals of the district. The government also seems to feel the need for such inputs and seem to recognize that the biggest bottleneck to better sanitation seem to be “people’s mindsets”. Mr. Basavajrajjappa was honest enough to admit that he did not have clean scalable answers to this. He, like many others in the government, feels CLTS is quite effective but requires extremely high resource intensiveness. In terms of the user-side of the context, my interactions were rather superficial given that I did not understand the local language and very few of the people (less than 2-3%) spoke Hindi or English. However, the one thing that did stand out as it often does for me, is how people’s mental models do not include a toilet to be an inherent part of their house. We saw several houses that seem to have been recently constructed for INR 250,000 or thereabouts. But people had not spent an additional 4% to construct toilets. Cognitive sciences talk about this bias called “anchoring”: people should have been framing the construction of a toilet when they build a house as just 4% extra and not as an additional INR 10,000 – which independently is a large amount of money. But there’s wasn’t any evidence of this having happened even in houses that were less than 5-6 years old by the looks of it. Clearly, some opportunities to anchor the toilet as a natural part of the house had been missed in earlier campaigns. But this is definitely a communication lever to keep in mind in future campaigns. Unfinished toilet in Davengere for which the NBA subsidy seems to have been paid. There were some very interesting examples where toilets had been left unfinished and were just lacking minor elements such as a door. But due to current guidelines of the Nirmal Bharat Abhiyan (NBA), people need to finish the entire toilet to get the payment from NBA. However, some of these toilets at least had painted numbers on them, which seemed to give each toilet a unique ID and also seemed to suggest that the subsidy money had been disbursed already. The explanation offered was that the local contractors were “seeking to make profits by doing this” and these toilets were not the result of end user demand. At its core, the Arghyam campaign is about creating “buzz” with a toilet event in the village to which people are personally invited; an IEC van making announcements, the Swachhata Dhoot going door to door giving invitations and urging people to come, and school children carrying out a rally, urging people to attend an event on the evening of the second day. The theme of the entire communication is that of a “responsible man” constructing toilets for the women in his house and fulfilling his responsibility. The central “stage” in a village where the event takes place. The entire thing unfolds over two days for each village and involves about 3 hours of standardized activity (the van, the rally, and the evening event) and as much as 7-8 hours of customized activity (the Swachhata Dhoots going door to door). To serve as a reminder to people who are eligible to claim the toilet subsidy and hence should participate actively in the campaign, there are also walls in the village that are painted with their names. There are two calls to action: a paper slip that people need to fill to express interest in constructing a toilet and second, a formal application form that needs to be submitted to the government. The campaign facilitates the collection of these forms as well. The IEC van and the generator that powers it waiting pre-event. 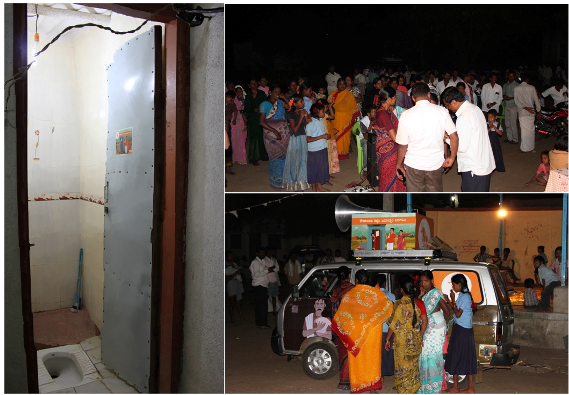 If one analyzes the inputs (costs, management time, & design time) that have gone into the campaign, the centerpiece of the campaign is the evening event which comprises of 3 films that are shown to attendees, a street play that seeks to evoke empathy in the husbands / fathers / sons for the “women in their life” who live without toilets, and finally the collection of demand slips and the application forms that formally induct people in the toilet construction and subsidy process. This evening event at all the target villages takes place at a central location with a makeshift ”stage” where people are supposed to gather. I saw a large chunk of these IEC components for the first time on the trip and felt that they were well designed in general. The play was a hit amongst the participants and I could see all – women, men, & children – smiling and nodding while watching it. Of course, there are tweaks that can be made here and there. For instance, it might be the case that the current set of films is a little too long. Certain aspects of it could be reduced for instance using the 5-minute animation film instead of the ten-minute version. It is important to start and finish with a “bang”. In the first village we went to, the program started with a 10 minute long film that wasn’t part of the pack. I could see people leaving midway while this was going on. It is very important that if extra content is being added to the program, it should come AFTER the planned IEC program and that it be approved with respect to content & theme by someone at Arghyam or Centre of Gravity. There is some merit in having form collection / slip collection immediately after the CEO film so that it becomes the call to action. In the second village that I visited, this worked really well. Arghyam is program managing the implementation of this campaign across 9 teams who will cover 100 villages in the district over two rounds of engagement, lasting a few weeks in all. While the design of the first round is described above, the second round is in the process of being designed and will start in a few days from now. It is definitely a challenge to adequately staff, train, and execute a campaign with 9 different teams in 2-3 months. And kudos to all involved for doing a good job. I’m going to focus my observations on the participation of people in the evening IEC event and their engagement with the campaign. The background is that in both the villages that I went to, about 50% of the attendees for the evening event were children and the remaining 50% were adults. Only about 10% of the adults were women. It was not very clear how many of the participant households had or did not have toilets. Currently, invites are being handed out to households the previous day, but no “RSVP” occurs. Could the Swachhata Dhoot go around collecting thumb-prints or signatures from people confirming their participation, asking them to respond very honestly about whether they will come or not? Perhaps the van can keep distributing the flyers as it goes around the village in the morning of the day of the event, and also perhaps the school children can be given flyers when the school rally happens. We have seen not more than 60-70 adults at both the IEC events. The number of children is about 80 – but this is largely irrelevant. These 60-70 adults comprised of about 60 males and 10 females. Assuming that out of these 60 adults, about 66% are from households who don’t have a toilet, we’re getting representation from about 45 households without toilets. This is about 25% of the total households without toilets in a village. This number needs to increase through the invitation process. There are hardly any women coming to the event. From what we’ve observed and discussed with the DSU, this is because women and even the “decent men” don’t want to come out at night to a location where there might be “drunks etc”. Could the invite be tweaked to get “husband-wife” pairs to attend? It is very important to place the event so as to maximize attendance – bringing it closer to the part of the village where the proportion of households without toilets is higher. The location should be chosen so that it’s not continuously disrupted by traffic. In the first village, there was a flow of tractors and trucks regularly leading to severe distractions. There should be adequate seating for at least 200 people. Otherwise, the men tend to form a ring around the tarp that is placed (which seats mostly children). This ring of men leads to a) Women not coming close and b) People floating in and out. Sitting and seeing this is a more comfortable experience and also has a higher “cognitive commitment”. The sound: The speaker on top of the van is a conical directional speaker. I’ve observed that the sound levels drop dramatically as one moves orthogonally to the speaker. Yet, in both the instances, the van was kept to one side facing straight. With a little tilting of the van, the sound experience will improve even with the same decibel levels. It will be very important to ensure that conversions happen from exposure to the campaign, to forms being filled and toilets being constructed. So there is a funnel optimization problem here: i.e. an increased collection of slips -> to forms submitted -> to pits dug ratio. It might be worthwhile to announce an inter-Swachhata Dhoot contest to maximize the conversion numbers. The total “prize money” could be somewhere in the order of INR 50,000 (broken in 4-5 prizes) – enough to incentivize better performance. It’s going to be very important to ensure that subsidy payments reach on time and that the DSU / CEO are getting a daily report (enabled by the software that Arghyam is in the process of designing or selecting) around key metrics of the project. A helpline / outgoing calling process could be put in place that periodically calls the households who have submitted slips to ensure that they are carrying through with the process. I’m looking forward very keenly to more data on the application form numbers from the first round of this campaign, and also the follow-up phase a few weeks later. Similarly, I’m really looking forward to the kick-start of the Final Mile campaign that begins very soon. Most people in the WASH sector have two implicit mental models that I feel need to be questioned a lot more. 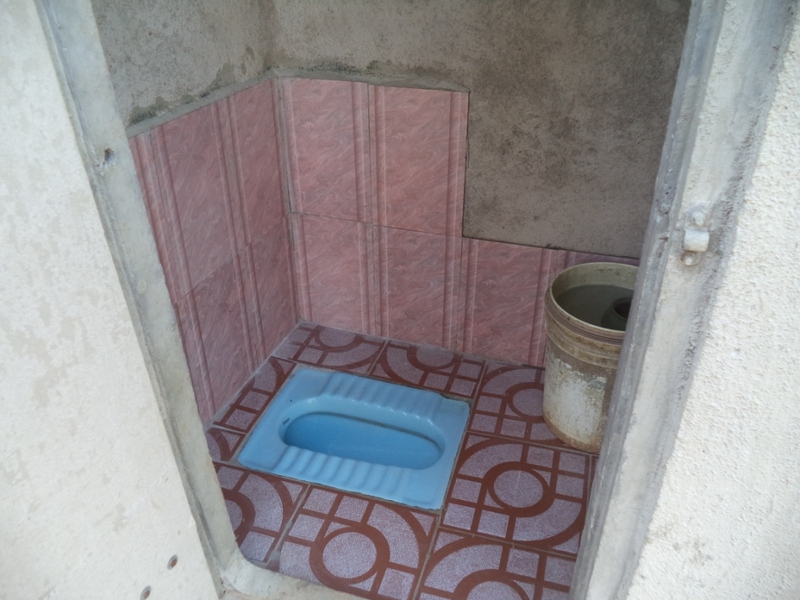 The first mental model is that most urban slums don’t have space and need community toilets. The second mental model and the focus of my observation is that “villages need household toilets”. This mental model is enshrined in the subsidy policy of the government and the focus of all campaigns I’ve seen so far to generate demand in rural India. All rural households have space to build a toilet as an augmented feature to their existing house: This is simply not an architectural possibility in many cases. I saw on this trip that several houses, especially the ones more proximate to the village center are packed edge to edge like townhouses with a 1-2 meter empty stretch in front where the household carries out activities such as washing dishes / clothes / lazing in the sun. Building a toilet without major architectural changes to the existing house is simply not possible. In some proportion of the houses, they may have space in the backyard, which is where the toilets can get constructed. In case, they don’t have space, they’d be willing and able to build a toilet some distance from the house: There are some cases where people build houses on empty land 10-20 meters away from the house (almost like an outhouse of the earlier days) but this is not universal at all and is going to become increasingly as rare as the per capita land availability shrinks even in rural India. A toilet is a toilet is a toilet: People believe that the probability of a household using a toilet is going to be the same no matter where the toilet is in their household. However, I don’t think this is true – people tend not to use toilets that are placed closed to the kitchen (for obvious reasons) and those placed in the front (for aesthetic reasons). Would we want a toilet to be the first thing that greets visitors to our house? Why do we assume that villagers would? Thus, one explanation of unused toilets in India could be that given the overly “supply side” process of construction, people didn’t really have a say in where the toilet got constructed and now don’t use it. In any case, even if a village has 15-20% of such houses that fall into the above categories, alternate provisions should be made to the policy. I would love to explore more whether this is one of the reasons why the form collection rates have been slightly lower than we were all hoping for. A part of the Communication for Sanitation campaign in Davangere district, Karnataka, India, this street play was performed on 29th January 2014 at Deverahatti village, Avaragola Gram Panchayat, Davanagere taluk. The play highlights the problems women face defecating in the open to men. So what are we up to? Arghyam is working on a communication strategy for sanitation, in collaboration with the Government of Karnataka. This strategy aims to improve the quality of Information, Education and Communication (IEC) under the Nirmal Bharat Abhiyan (NBA). A communication campaign will be created from this strategy, which will be piloted in one district in Karnataka. Two communication agencies have been brought on board. Centre of Gravity is looking into generating demand for toilets, while Final Mile is exploring behavioural issues that prevent people from using toilets. Centre of Gravity has developed a comprehensive communication campaign that can be executed by districts using the IEC budgetary allocation within the NBA. Final Mile uses a unique combination of cognitive neuroscience and behavioural economics to develop behavioural “nudges”, to get people to change their behaviours and use toilets. Arghyam is also partnering with Public Affairs Foundation to help in measuring the outcomes of this project. 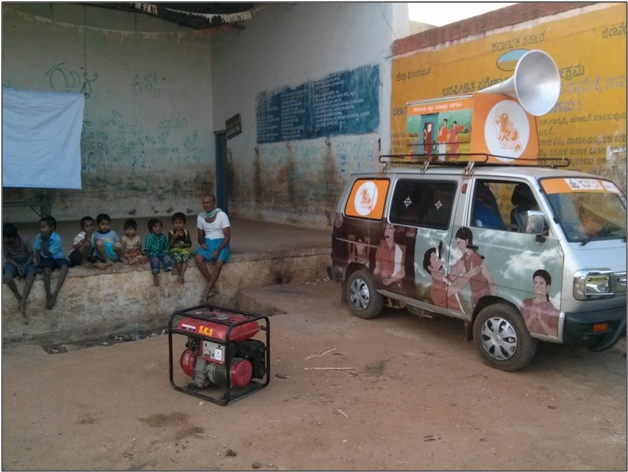 Currently, the demand generation campaign has been piloted in 25 Gram Panchayats in Davangere district, Karnataka. Arghyam is now looking at creating a toolkit that the Government of Karnataka can use across the state, to motivate people to build and use toilets. Other districts will implement the campaign using their IEC budgets under the NBA programme. A second evaluating agency, Catalyst Management Services has also joined the project to monitor outcomes on the toilet usage piece being done by Final Mile. This blog is a running commentary on the progress of this project, featuring guest posts from various stakeholders and partners. We hope to share experiences from the project on this blog, because we believe that an open and honest conversation can result in collaborative solutions. Sanitation is one of the most wicked and pressing problems that India faces today, and we want to play a part in changing that, however small or big.